Our proposal is to promote the integral development of children and teenagers to help them become citizens capable of contributing to a better world. Affinity Arts is an international school, founded 23 years ago, with emphasis on an innovative education that utilizes arts and sciences as primary tools for the base curriculum. The areas of sciences, social studies, mathematics, and ethics are interlinked and make up the curriculum of the grade levels. We offer a solid and structured education. The conciliation of the themes from different fields, associated with music education and teachings in English, are well-proportioned with a dynamic and significant education. Affinity Arts firmly believes that all children have unique talents and searches for development of this latent potential as a resource, and for opportunities. ​The incentive, as a vital life-tool, is essential. Follow the latest Affinity Arts activities and events. Inauguration of our blog with super interesting tips and everything that happens in the world Affinity ! and we are capable of conquering unity in diversity! Classes at Affinity Arts possess a unique routine, full of diverse activities, that benefit the learning & teaching process, and establish the insertion and connection of artistic activities. ‘‘... Somos eternamente agradecidos a vocês, que são e fazem todos os dias a Affinity Arts..."
‘’... Gostaria de agradecer todo o carinho e profissionalismo no cuidado com nosso filho..."
‘’... Em todos os dias de convivência com a equipe Affinity tivemos ótimas experiências..."
Our school has a YouTube channel. You can watch the school videos of the main events and educational attractions. Watch and share. We offer daily art classes. The visual arts permit the capacity to mold, modify, restructure, and give new meaning to more diverse materials to conceive and share feelings, ideas, and foster cognitive maturation. It is important to consider that these ideals promote the integral development of the individual: intellectually, emotionally, socially, perceptively, physically, aesthetically, and creatively. All these aspects can be developed by means of creation. For this reason, teaching arts is a fundamental method for students to understand themselves and others. To develop understanding of their own reality, in the expression of their feelings, emotions, desires, and projects, in their personal and social autonomy. 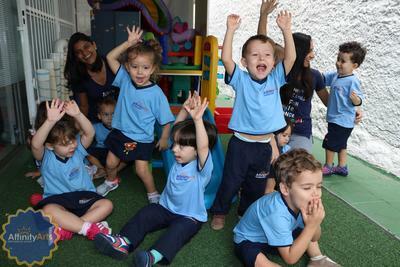 We offer multiple exemplar instruction that utilizes the interaction of the two languages (English & Portuguese). Bilingual development is supported in an efficient manner when the language is used as a means of teaching. The cognitive and linguistic junction provides motivation and opportunity for significant communication. ​Music is constantly present in all the school environments, conforming with actual scientific studies, increasing cerebral activity and making possible the largest number of neural connections. The musicians that administer the classes are professionals and experienced educators that elaborate the specific program every step of the way and in accord with the thematic pedagogical program for each semester. We have musicians on the piano and also utilize classical music in all the ambients of the school. Beyond the music being played, we also offer optional musical instrument classes (piano and/or violin). As the student evolves with the instrument, an opportunity arises to integrate into our Chamber Orchestra, which is composed of teachers and professional musicians. We recognize the value of the cultural origins of the families that make up our school community. We are proud to celebrate this diversity. Our objective is that everyone learns to appreciate each other as world citizens, free from any prejudice. Bilingual education and the contact with different nationalities establishes a series of benefits for the cognitive and emotional development of the children, for the resolution of problems with empathy, required capacities in a world interconnected more every day. When a language provides the opportunity to interact with different people, it helps to generate empathy for diversity, tearing down walls and nurturing a global outlook. All the members of our Affinity Arts community are respectful and receptive. We search to increase knowledge about different cultures, recognizing and valuing their differences and similarities, beyond promoting a better world, without borders and free of prejudice. We believe that, through education, we are capable of conquering unity in diversity. 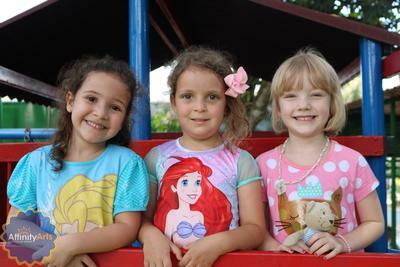 Learn everything that happens at your child's school with exclusive information!